The fifth wheel hitch is commonly used on trucks in the USA and is used to tow heavy trailers and a range of other cargos. 5th wheel hitches are installed on the bed of the truck and the trailer hitch extends over the rear bumper, which distributes the weight between the cab of the truck and the rear axle. The best 5th wheel hitch is the CURT 16245 Q24 Hitch, which can be used for towing up to 24,000 LBS and features a dual jaw system for 360 degree kingpin contact. Before choosing your 5th wheel hitch, you will need to determine the trailers gross weight and the max king pin weight. With regards to your truck, you will need to measure the length of the trucks bed as many fifth wheel hitches can be large. For those that drive a short bed truck and want to install a 5th wheel hitch, you will need to go for a sliding hitch instead of the standard. The difference is that a sliding 5th wheel hitch is able to move around on the bed and reduce the risk to the trailer hitting the cab, which would happen when backing up. 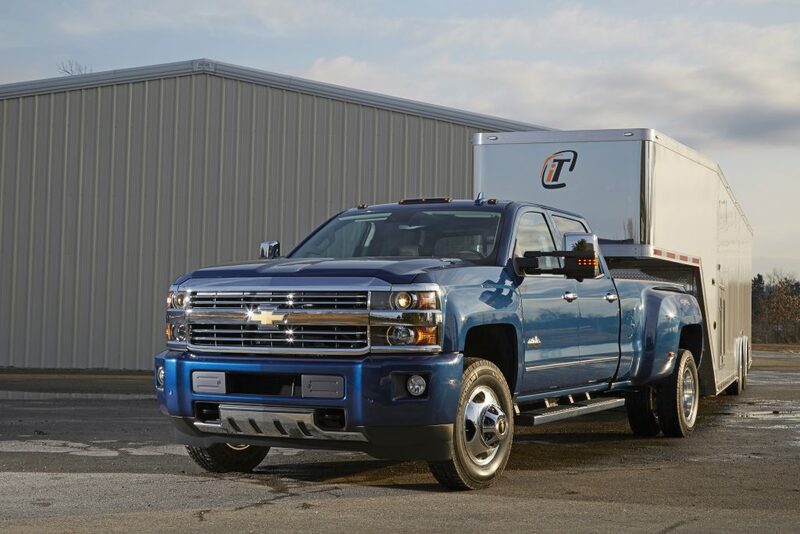 The weight capacity of most 5th wheel hitches range from 15,000 LBS and 30,000 LBS, which is much more than a weight distribution hitch will be able to handle. From towing RVs to heavily loaded trailers, this type of hitch will improve your towing experience massively. Below is a list of the best 5th wheel hitches that contain both fixed and sliding examples to fit a range of trucks. Curt are a huge brand in the trailer and hitch market and the 16245 Q24 is their premium fifth wheel hitch, which is rated for towing 5th wheel trailers at 24,000 LBS. It also features a state of the art self aligning head, which provides a wide opening for making coupling of the trailer much easier. This Curt 5th wheel hitch features a 360 degree tilt, which allows the hitch head and coupling point to tilt at any direction. This results in a much smoother and quieter ride out on the road and is definitely a unique selling point of this hitch. In order to fully wrap the kingpin, the Curt Q series uses a dual jaw connection, which prevents the chucking noise but also improves the security. Overall the CURT 16245 Q24 is the best 5th wheel hitch you can buy with excellent features that result in a smooth and quiet ride. The reason why its not as popular as it should be is primarily down to the large expense of purchasing it. On the top of the hitch, you must also purchase rails and the cost do add up but it is the ultimate hitch and a worthwhile investment. If you have a short bed truck and want to be able to tow using a 5th wheel hitch, you will need to opt for a sliding hitch. Compared against a standard fixed alternative, it is more expensive but tight maneuvers are much easier and you reduce the risk of the trailer forcing its way into the cab, which will be a costly mistake. The performance of the B&W RVK3400 is fairly impressive as it has a maximum towing capacity of 20,000 LBS and uses a dual jaw for the connection of the hitch. In terms of the sliding movement, it provides 12 inches of movement, which is great for extra turning clearance. It also contain no rails and this means removing this 5th wheel hitch is much simpler, which is desirable for many wanting to use their truck beds for hauling cargo. Overall, it is the best 5th wheel hitch for short bed trucks but the price may put of many buyers as its the most expensive in this article. However, the sliding mechanism, limited lifetime warranty, ease of installation and other features should provide you with peace of mind. Andersen Hitches are just as big of a brand as Curt and produce a range of towing equipment. The 3220 5th wheel hitch is designed for all trucks, which includes short bed to long bed and is rated 24,000 LBS gross trailer weight capacity. It is the lightest 5th wheel hitch within this article too as it weights just 35 LBS, which is impressive considering the GTW value. The lightness also makes installation very easy and Anderson Hitches claim it can be done within 5 minutes. The 3320 model by Anderson Hitches has a hitch ball that has almost 3 inches of adjustable height and rides inside a greaseless coupler. It will also swivel in every direction to an impressive 90 degrees if needs be. Lightness and the ease of installation means you are able to disassemble this hitch by yourself and have the bed free and clear when you are not towing. This is a very desirable feature of many truck owners. Overall, it is the best gooseneck hitch for your 5th wheel trailer and is the perfect alternative to the other fifth wheel hitches within this article. Curt also offer a sliding 5th wheel hitch known as the 16521 A16 model and it is able to tow at a gross trailer weight of 16,000 LBS. In terms of its sliding abilities, it allows for 12 inches of travel on the truck bed and it rolls on wheels and solid rods that are designed not to bind. As with the Q Series by Curt, this hitch uses an interlocking dual jaw type and has an extra wide and self aligning head opening for an easier connection with the trailer. Thanks to torsion springs and poly-torsion inserts, the head is kept stable whilst travel and this further reduces any noise coming from the 5th wheel hitch. Its a well built 5th wheel hitch that has been built to last with a limited lifetime warranty. Overall, the CURT 16521 A16 is the best sliding fifth wheel hitch for the money and is cheaper than the B&W alternative with the only noticeable difference being the GTW. For those on a budget and want a cheap 5th wheel hitch that can handle a large amount of weight and easy to install, then the Pro Series 30128 is ideal. It is a budget solution that is developed by the reputable Reese brand. In terms of the weight ratings, the gross trailer weight capacity is 15,000 LBS and the pin weight capacity is 3,750 LBS. It is a sliding 5th wheel hitch and it uses a rounded slide bar mechanism that is designed for automatic latching. The ProSeries 30128 vertically adjusts from 13 to 17 inches and uses a 4 way (left, right, forward and back) pivoting head for an easier connection with the trailer. Overall, it is a cheap fifth wheel hitch that is a fraction of the cost of some of the premium alternatives in this article The Reese ProSeries 30128 is by far the best bang for your buck and it will not leave you disappointed. 5th wheel hitches is one of the best ways to transport a heavy trailer or RV safely and still have the ability to comfortable maneuver within tight spaces. However, the main disadvantage to the 5th wheel hitch is the fact that it is “semi-permanent” and will limited the use of your truck. They are mounted on the truck bed and usually right in the center and they are usually not that easy to remove and install quickly. Therefore compared against a normal car tow hitch, it is much more important that you purchase a fifth wheel hitch that is built to the highest quality and easy to use. As you can imagine, there is plenty to talk about with regards to fifth wheel hitches and below is a buying guide discussing all the factors that you should consider. All 5th wheel hitches will have a gross trailer weight rating (see table) and its crucial that you do not overload your hitch. Too much weight and you will simply break the hitch, which can be very dangerous on the road. The majority of GTW ratings range from 10,000 LBS to 25,000 LBS, which the larger ratings being more expensive. Your vehicles rated towing capacity is also another rating that so many people forget to check. If you have a low towing capacity on your truck, you are probably best upgrading your truck before purchasing a fifth wheel hitch. It is dangerous to tow over your towing capacity and if you were to be pulled over by the police, you’d be in a big trouble. Performance will also be an issue as steering and stopping the vehicle will be much harder. We do recommend that you purchase a trailer brake controller inside the cab for added control and to comply with the US law. To be on the safe side, we highly recommend going for the highest rating your vehicle can handle. This will ensure you are able to use a range of heavy trailers in the future without the need of upgrading at a later date. You will notice that we have recommended both fixed and sliding hitches within this article. If you do not already know the difference, in short, the sliding fifth wheel hitch moves (usually between 10 to 15 inches) in order for adequate turning clearance without hitting the cab. This type of mechanism is needed for short bed trucks with a length of 6.5 feet and below. So you are probably thinking, if they are so good, what is the point of a fixed alternative? As good as a slider 5th wheel hitch is, the fixed mechanism also has many benefits. These include price, they are much lighter and also they do not “chuck” as much because there is less moving parts. If you have the room on your truck bed, we recommend going for a fixed hitch but if you have a short bed truck, the slider mechanism is the one to go for. The main difference between a gooseneck and fifth wheel hitch is that a gooseneck connects via a coupler whereas the fifth wheel uses a king pin and pin receiver. You will notice that we chucked in a gooseneck hitch within the top 5 and rated the Andersen 3220 gooseneck hitch as the best. Before you purchase any fifth wheel hitches, be sure to take accurate measurements because if you have a short bed truck, you will want to purchase a sliding hitch instead of a fixed alternative. You will also need to mark the gap between the rail positions and the cab because they must be at least 4.66 feet for a long bed truck and 3 feet for a short bed truck. You will then need to measure the distance between the tailgate and the hitch, which should be around 2.35 feet for a long bed truck and 2.19 feet for a short bed truck. Once the measurements are all taken and you have marked out where the correct position is, you are then ready to install the hitch and rails. Most provide an easy to follow installation kit with everyone you require but be sure that the rails are included. Due to the large amount of different types of hitches and installations, it is hard to state an ideal installation guide. With the fifth wheel hitch you buy, it is best to follow their exact instructions for peace of mind. There are three main types of hitch jaw mechanisms and they include a slide bar, double jaw and single jaw. A slide bar jaw is found on most of the cheaper fifth wheel hitches and although its very secure, it does suffer from king pin noises and the dreaded chucking due to the fact its a looser connection. With a Double jaw mechanism you will hear far less noise from the king pin. It is also more comfortable as the king pin is held more tightly but there still might be slight movement. Finally the single jaw is the simplest and most quiet as the kingpin is completely held by the hitch jaw. This results in a better ride overall and is the go to hitch mechanism for many experienced towing drivers. If security is a big concern, there are many trailer locks that will work with fifth wheel hitches to further secure your trailer. Hitches can come with a range of pivoting options, which include single, double and 4 way pivoting. This allows the hitch to move left, right, forward and backwards, which helps absorb energy from going up or down hills and on tough terrain. As the 5th wheel hitch ages and continues to spend time outdoor, it will need some attention before its too late. Lubrication is one of the most important things to do as it will ensure that all the moving parts are in good working condition. Using an automotive grease gun, lubricate the skid plate surface and any moving parts. We highly recommend that you remove any old or dirty lubricant from before applying new lubricant. As a safety precaution, you should also perform checks of all the fasteners and other hardware. Appearance can become an issue as well as rust buildup from constant movement and connecting of trailers. If you notice any rust, be sure to use a high quality rust converter to prevent it spreading any further. Damage to the trunk bed liner is fairly easy to fix with a DIY spray on trunk bed liner kit and you can easily hide all the scratches and defects from the installation and usage over the years. 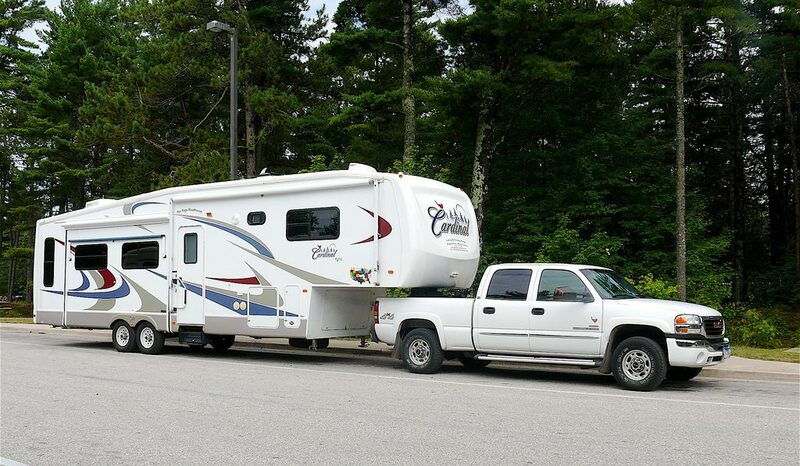 For safely towing heavy trailers and RVs with your truck, a fifth wheel hitch is a must. They are easy to install and relatively cheap considering the build quality and what they are used for. Our recommendations within the article are high performers and popular among experienced towing drivers. Curt, Anderson, B&W and Reese are all the major brands within this sector and the best of what they have to offer are listed within this article.